A magnitude 7.3 earthquake occurred on Thursday, June 23, 2011 at 6:09 pm AKDT (June 24, 03:09 am UTC) in the Fox Islands region of Alaska (red star on the above map). It was located 195 km (122 miles) ESE of Atka and 236 km (148 miles) SW of Nikolski. AEIC located about 500 aftershocks (white circles on the above map) through end of October, 2011. About 50 aftershocks have magnitudes 4.0 or greater. The largest aftershock of magnitude 6.8 occurred on September 2 at 10:55 UTC (2:55 am AKDT). Due to the lack of seismic instrumentation in the region, only afteshocks of magnitude about 3 and above can be detected. The mainshock was felt in many Aleutian Island communities, with the strongest intensity of shaking reported in Nikolski (intensity VI, strong). See Did You Feel It archive for distribution of felt reports. The Aleutian Islands region, where Pacific plate is being forced under the North American plate, is one of the world's most active seismic zones. In 1957, magnitude 8.6 Andreanof Islands earthquake ruptured a ~600 km-long portion of the plate boundary in the central Aleutian Islands. 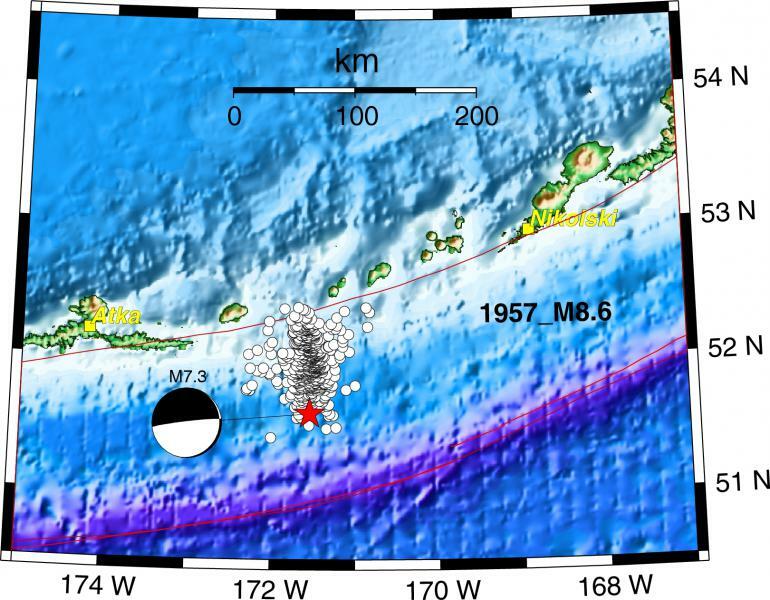 The June 24, 2011 M7.3 earthquake is located in the central part of the 1957 rupture zone. In 1986, a portion of the western half of the 1957 zone failed in an earthquake of magnitude 7.9. In 1996 another magnitude 7.9 earthquake appear to have completed re-rupture of the western end of the 1957 zone, immediately westward of the 1986 region. No other major (magnitude 7 or greater) earthquakes occurred within the 1957 rupture zone up until June 24 event. Depth and faulting type of the June 24 earthquake is consistent with it being an intraslab earthquake, i.e. it occurred inside the subducting Pacific plate rather than on the plate interface.